Secretary of Defense James Mattis has warned the Syrian regime against the use of chemical weapons after reports of chlorine gas being used by Assad forces against civilians in Eastern Ghouta surfaced. Mattis did not rule out a military action to deter the use of such weapons amid the country’s near seven-year civil war. Other officials raised the alarm about the chemical threat in Syria saying that it was “highly likely” that Assad kept a hidden stockpile of chemical weapons after 2013 that he failed to properly disclose. The US and Russia agreed to destroy Syria’s chemical weapons arsenal in 2013, with weapons due to have been removed or destroyed by 2014. 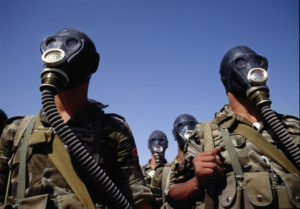 Several UN Security Council resolutions and the Chemical Weapons Convention also ban the use of such weapons. Chemical weapons have been used on several occasions during the war, which has claimed at least 400,000 lives and displaced 22 million people since fighting began in 2011. Posted by Jaber Ali on Feb 3 2018. Filed under Headlines, World News. You can follow any responses to this entry through the RSS 2.0. Both comments and pings are currently closed.